Life is almost back to normal for Harper Price. The Ephors have been silent after their deadly attack at Cotillion months ago, and best friend Bee has returned after a mysterious disappearance. Now Harper can return her focus to the important things in life: school, canoodling with David, her nemesis-turned-ward-slash-boyfie, and even competing in the Miss Pine Grove pageant.Unfortunately, supernatural chores are never done. The Ephors have decided they’d rather train David than kill him. The catch: Harper has to come along for the ride, but she can’t stay David’s Paladin unless she undergoes an an ancient trial that will either kill her . . . or connect her to David for life. 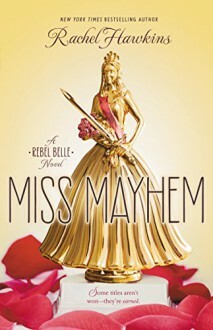 It was a fun, fast paced read and that's it, nothing special.I liked Rebel Belle way more.